Grainger Public Relations » P-p-p Pick up a Cake! P-p-p Pick up a Cake! 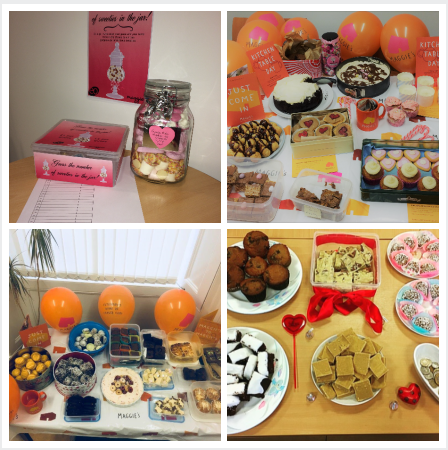 Scottish accountancy firm EQ Accountants has kicked off its annual fundraising campaign in delicious style! With its charity of the year revealed as Maggie’s Centres, EQ Chartered Accountants launched its 2018 calendar of fundraising activities on Valentine’s Day (Wednesday 14 February 2018), with bake sales held across its offices. In Dundee, staff also enjoyed meeting one of Maggie’s mini penguins, who made an exclusive, one-day appearance as part of EQ’s sponsorship of the Maggie’s Penguin Parade. Staff were treated to an impressive array of home-baking with their morning cuppa, with around £400 in donations being ploughed into the deserving cancer caring charity. The bake sales are the first events in a year-long programme of activities and initiatives led by 25 of the firm’s fundraising champions, across their offices in Dundee, Glenrothes, Forfar and Cupar. For three months during the Summer, the streets of Dundee and the surrounding region will be home to a trail of individually designed and beautifully decorated giant penguin sculptures showcasing the wealth of artistic talent in the area, creating economic and cultural benefits for Dundee.